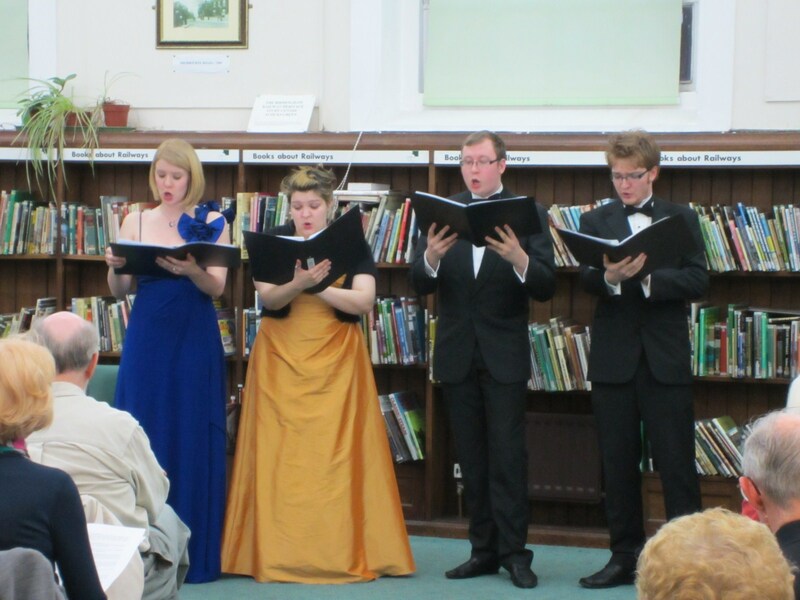 The April 6th Swansong at Acocks Green Library was an opportunity, shared by approximately 50 members of our local community, to witness an outstanding unaccompanied performance of madrigals and other songs by the talented Beorma Quartet. Comprising of Soprano Amy Secretan, Mezzo Soprano Clare Barnett-Jones , Tenor Matthew Spillett and Bass Lewis Jones. Together they presented a splendid evening of vocal music spanning 1000 years. The quartet was formed by students and graduates from the Birmingham Conservatoire which is part of Birmingham City University. The name ‘Beorma’ is the original Saxon word for the area now we now know as Birmingham. Librarian and local historian Mike Byrne is the organiser of the Swansong performances at Acocks Green library. Mike informed the audience that although he will soon be leaving his job at the library he will continue to organise the popular and always enlightening Swansong concerts. He also told the audience that the usual spring concert by members of the CBSO did not take place this year as the result of loss of the CBSO’s community sponsorship funding. The next Swansong performance is at 7.30pm on 11th May at Acocks Green Library, with the Consort Pleon presenting music by Handel, Corelli and Albinoni. Tickets are free and available from the library. Everyone who enjoys live music is welcome. A collection is made at the end of the concert. This entry was posted in Events and tagged Acocks Green Library, Amy Secretan, Beorma Quartet, Birmingham City University, Birmingham Conservatoire, CBSO, Claire Barnett-Jones, classical music concert, Lewis Jones, Matthew Spillett, Mike Byrne, Swansong. Bookmark the permalink.